Here's a question I never expected to be answering: “How do I go about finding holy water?” It came from a newcomer to the Céile Dé tradition, in which we use water to bless ourselves as part of our daily meditation practice. But it took me back quite a few years to the bat mitzvah (coming of age) ceremony for the daughter of long-time friends. The remarks that this young lady gave after her Torah passage touched on the nature of the holy. She observed that objects, such as a kiddush cup, are not sacred in and of themselves, but that holy is a quality that a thing acquires through its dedication to sacred purposes and its usage in a spiritual context. Thus, there is a human aspect to those material items that we cherish as holy. I collected water from Glendalough ("glen of two lakes"), because St. Kevin lived and prayed there, and because it was so beautiful on a drizzly May morning. In other words, what makes water holy is not so much that it comes from a sacred source – although that certainly is a lovely thing in itself – but that we wrap it with our holy intention to use it in ways that draw us nearer to God. Take, for example, the water that those of us who travel to the Celtic lands bring back from our pilgrimages. 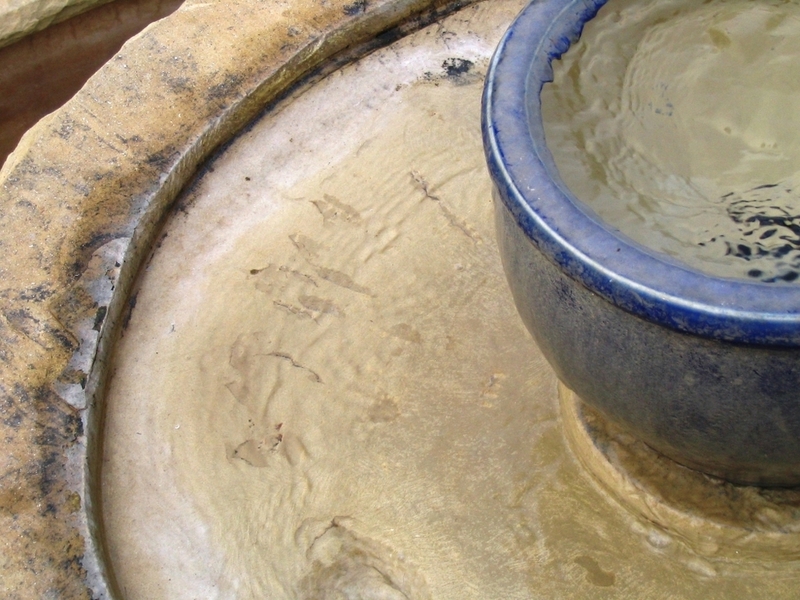 Knowing where the water came from and how many saints and pilgrims have touched the same source – whether it’s a “holy well”, a stream, a lake, etc. – helps us be more mindful and more intentional when we use it for blessing. And it’s the quality of those prayers that makes it truly holy water. So, back to the question, how do you find holy water? If we were in Ireland or Scotland, a holy well might lie around the next bend in the road, but that's just not the case here in the United States. The question itself holds part of the answer, for it contains the intention to find water for blessing, to undertake a quest. In the Céile Dé tradition, we listen to what the land has to offer as guidance in spiritual matters. I once was drawn off the interstate highway and onto a scenic upland road where I stopped at a spring that seemed to have a special quality of cleansing for me. I doubt that I would have noticed it if I hadn't been willing to listen to something bigger than my aim to get home. In arid regions, fountains, like this one at Pacifica Graduate Institute in California, may embody associations with peace and refreshment that make them potential sources of water for blessing. You might explore your own connection with the land as you search for a water source that will touch your heart whenever you think of it. Is there a garden where you’ve sat by a fountain or pond and felt the peace of God? Is there a place in the mountains where you’ve encountered water in its icy purity? 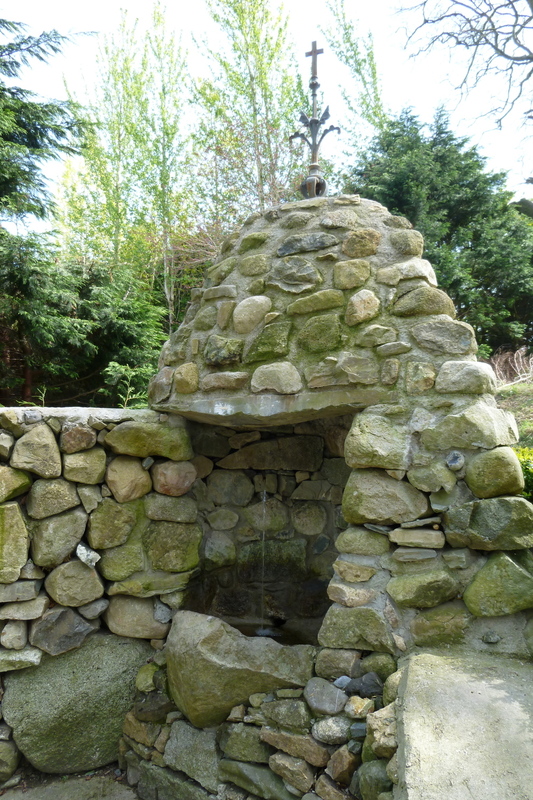 Do you know a local spring that may have been used by people who lived in your area hundreds of years go? Does a heavy morning dew make you yearn for a crystal font in which to collect the droplets? The actual well associated with St. Brigid in Faughart is a little higher up the hill, but this source near her stream is the one that most pilgrims use to gather water to take home. Because you never know when you will find the right source (or it will find you! ), you might want to carry a small empty container with you. When you gather the water, you can say a simple prayer of gratitude in your own words. You also might want to make a small gesture of respect, e.g. tidying up whatever needs tidying. I am certain you will know what to do. For example, last spring, I fished a sneaker out of a Irish well deemed to be sacred to St. Brigid. I just couldn’t collect water and then leave the shoe still dirtying up the place! There’s no need to rush it. Until you find your own “sacred well”, you can certainly use bottled spring water for blessing. Even in the marketplace, you can bring your intention to the selection process, looking for water from a nearby source or from a company that operates under principles you admire. And there’s really nothing wrong with tap water, especially if it’s going into a vessel that is sanctified by the hours it rests on the altar and by the many gestures of blessing that it has conveyed. The water I will drink tonight in a restaurant in Hollywood is by now well down the Los Angeles Aqueduct from the Owens River, and I also think about exactly where that water is: I particularly like to imagine it as it cascades down the 45-degree stone steps that aerate Owens water after its airless passage through the mountain pipes and siphons. The New Croton Dam in the Hudson Valley of New York combines human ingenuity with the natural beauty of falling water. Didion also imagined what she'd do if she were given control for a few minutes – which gates she would open, which canals she would fill. I can relate to that! A great uncle of mine worked on one of the big southern California water projects, working his way up from chainman to superintendent over the course of 20 or so years, and my mother was part of a group of dedicated “river rats” who helped the Chattahoochee River gain federal protection. From an early age, I was moving rocks into “dams” across small streams, and I can still type from memory these opening verses of Sidney Lanier's “Song of the Chattahoochee”. And flee from folly on every side . . . . The rivers know: It would be folly to think that holy water can be found only in specially blessed bottles and urns. Those who seek it will know it when they find it, just as I did, when I came across a pool on the Scottish island of Iona that made me put my camera away and kneel instead.